Because heroin and opiates are physically addicting, heroin detox becomes necessary when the body adapts to the presence of the drug. 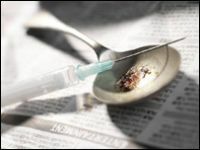 The addict's body becomes tolerant to heroin's effects and more and more is needed to reduce ones' physical and psychological cravings for heroin. Withdrawal symptoms will definitely occur if heroin use or opiate use is abruptly discontinued. Today, there are several forms of heroin detox available. They include: medically based heroin detox, opioid agonist drugs, such as methadone, levo-alpha-acetylmethadol (LAAM), or Buprenorphine; Clonidine, which blocks some withdrawal symptoms; ultra-rapid opioid detox under anesthesia; and an experimental method using the drug lofexidine. Opioid agonist drugs act like heroin but do not provide the same high and are administered in gradually decreasing doses. Since these medications act like heroin there are no withdrawal symptoms. Relapses continue to occur in numerous cases around the world therefore making heroin detox a very difficult process. Statistics show that the average heroin addict will stop and start detox 10 to 25 times in their lifetime. Heroin withdrawal and other opiates may occur as early as a few hours after the last use. The withdrawal symptoms of heroin addiction include drug craving, restlessness, muscle and bone pain, insomnia, diarrhea, vomiting, sweats and cold flashes. Major withdrawal symptoms of heroin addiction and other opiate addictions peak between 48 and 72 hours after the last dose. Without proper heroin detox care seizures or convulsions can occur. The good news is that an addict can usually complete a drug-free heroin detox or opiate detox program within five to seven days. For many, withdrawal symptoms continue to be the greatest obstacle in heroin detox treatment. Studies concur that there is no proof that one heroin detox treatment is better than another. However, many recovered heroin addicts feel that choosing to detox off heroin without the use of additional drugs makes for an easier recovery in the long run. This is because the recovering addict is not switching their addiction from heroin to methadone, LAAM, etc. They are able to complete the detox process and move on with their recovery process. Heroin detox involves admitting there is a problem, seeking medical help, staying focused on the goal and rehabilitation and treatment through a continuing program. All facts conclude that there is no easy cure nor guarantee that relapse will not occur. The determination of the recovering person and support through family, friends, physicians or other sources must accompany the heroin detox process. Heroin detox and opiate detox can be a very challenging process both physically and emotionally. It is our opinion that anyone undergoing heroin detox or opiate detox, should do so in drug rehab programs or addiction treatment programs that specialize in medical detox programs. All heroin detox programs should be medically monitored, complete with 24 hour nursing and directed by a physician trained in addiction medicine. Once heroin detox is complete, a long-term rehab that is drug-free is necessary for ones continued sobriety. Many times, although not physically dependent on heroin, psychological cravings will overcome the former user throwing him or her into relapse. Generally speaking, the best-documented drug-free treatment for heroin addiction are therapeutic community residential programs lasting at least 3 to 6 months.